Do Relatives/Friends Think You're Down on Your Luck? Home › Forums › Before and After › Do Relatives/Friends Think You're Down on Your Luck? This topic contains 36 replies, has 21 voices, and was last updated by bandicoot 8 years, 8 months ago. 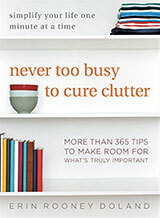 I was reading the post on “Can Un-cluttering be a Bad Thing” and wondered if anyone else has run across this problem. Do friends and relatives come to your home, take a look at your lack of clutter, and make an assumption that you are broke and can’t afford anything…then buy you things that they think you need? I DO appreciate their kindness and caring and I know they mean well (and I know this is not an earth-shattering problem by any means), but I am forever giving away things that others feel I need. (We have a Free Store in our town where you can take things for families in need…so everything is being put to good use 🙂 One relative started a rumor that our house was in foreclosure and we were selling everything in it to make ends meet! It’s a little maddening…how do you folks deal with it? That is truly horrible – someone started a rumor?? It’s a real shame that because we live without clutter people think we’re struggling financially! I haven’t experienced what you have gone through just yet but I am sure I will at some point. I don’t shop very often so people probably question if I am “poor”. However, most of my family knew that I was becoming a minimalist and therefore had some background on my lifestyle. Is there a way to educate your family about being a minimalist? I find that, because I am so passionate about it, that I speak about minimalism a lot and therefore my friends and family know that I choose to live this way. Sometimes all they need is a little information! When my husband and I were first married, some of his family commented on my sparsely decorated living room. Apparently, it bothered them that the flat surfaces in my house weren’t covered with knick-knacks and the walls weren’t filled with whatever it was that they wanted me to hang on my walls. My MIL started to gift me with things to hang on my walls and display on my tables for birthday’s, Christmas, and Mother’s Day, etc. These gifts came with great affection, but I also got the feeling that, in her own way, she was helping me decorate my house. It was very kind of her to want to help, but we didn’t have the same taste, at all. The things she bought very inexpensive things, and at the time I did not buy something just for the sake of filling up space. But… I was young back then and my new tribe (the inlaws) weren’t approving of my sparse decor, which made me feel like maybe there was something wrong with that, so I bought things to “fix it”. I realize now that I am more minimalist at heart. Sounds like one of two things. Either your home is so sparse/hard it doesn’t feel homey (don’t need “things” to make it feel homey, but a rug or some artwork really helps soften things up), or—and this is more likely—you haven’t communicated to them about your desire to live simply. Perhaps you told them, but it wasn’t communicated, since clearly they didn’t get the message. Be more vocal about your joy of living simply! If they start to understand that you love the way you live, they’ll start to back off. I think they do! People can’t believe I actually want to get rid of stuff and don’t want to go shopping. Last week I sold 3 birdcages (found new homes for the birds because I’m allergic to them) and I got funny looks like they thought I couldn’t afford them! If someone thinks we are down and out, selling our valuables to survive, I don’t even care any more. I’ve tried to explain but they believe what they want. This week I’m selling 2 huge Cuisinart pans that I never use so I can only imagine what they will think! It’s really funny, kinda my own private joke! Most of them don’t want to understand. They are typical Americans who love their stuff and love going shopping to get more stuff and then go home to put their new stuff away only to find they don’t have enough room for their stuff, so they move to a bigger house and build bigger garages and put additions onto their homes, and build storage shelves in their basements, and fill their attics and continue to struggle with bugling cabinets and drawers. Then they come to my house and can’t wrap their head around the ‘less is more’ concept. The big July family party will be at the house of one of the BILs and his wife who built an addition onto their house because, and I’m not joking here, “they had too many clothes”. They bought big furniture to store all of their clothes, and they felt squeezed out of their bedroom. These people are around 40 and they still have their clothes from high school. Anyways, I can’t wait to see the addition. I haven’t been invited to see it because I offered to help them declutter first, which they considered, but opted to keep all their crap and put on an unnecessary addition. ArtGal – how insulting!! I can’t STAND rumormongers. Do you live in a small town by any chance? I’ve noticed here in the too-big city, gossipy types fill their time with society/celebrity trivia and mostly leave “private” citizens alone. Most of the people who come into our home know we are dancers, so the big empty living room/dance floor doesn’t surprise them. Plus, there is still plenty of stuff. Enough so that family who have visited can get a sense of our taste and realize we don’t need any help decorating. Thank you all for the advice! 🙂 I suspect that you are all correct, it doesn’t matter what I say, they will believe (and say) what they want…and I will continue to live happy (and simply!) It’s just FRUSTRATING constantly undoing the crazy stories…I think I will quit that and take a nap instead! Once, when I was younger, I went on a decluttering binge and gave away a bunch of things to friends I thought would enjoy the items…One of them asked me if I was giving all the stuff away because I was dying. I can’t believe what I am reading. Is dying the only reason to give away stuff? And is a home not comfortable if every corner and inch of space isn’t full of dusty knickknacks and other useless junk? It appears that the American mania for shopping and acquiring “stuff” is reaching epidemic proportions. If you don’t have and display enough stuff, apparently there is something wrong with you. It’s a stigma, like being single or not having kids. People need to wake up. In 1946, the bodies of two brothers were found underneath a huge pile of stuff they had accumulated in their apartment. Now it’s 64 years later, and people still bury themselves in junk. it’s like an alternate reality! our friends and family definitely don’t assume that we are broke. maybe i roll with a different crowd or perhaps it is different in australia? we don’t have kids; we travel a lot; we take plenty of time off to do what we like; we work for ourselves and it is fun, creatively challenging AND financially rewarding; we have a 5 acre garden; we have the most beautiful clean air and clean rainwater and we grow plenty of our own food, and we throw frequent dinner parties…..we live like millionaires! any one of those things above is more important to me that having a house full of tchotchkes. i simply cannot understand the mentality of valuing a collection of “stuff” over various freedoms of lifestyle. if friends/family have the exact opposite opinion, well that’s ok with me. i don’t have to live it. suzjazz – I agree – I want to get rid of even more stuff now, after reading this thread! Bandicoot, I envy your lifestyle. I don’t worry about what people think. 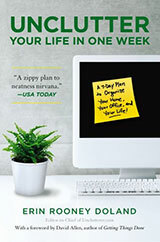 I remind people that my career is to help people live life clutter free! I make no judgments, if someone wants to fill up their home with “stuff” to make it homey feeling or believes that things equate to some type of validation, that’s ok! What I’ve learned is that for me, it’s easier to have less! I did a major kitchen reorganization project this weekend (almost done, two more cabinets!). My neighbor came up this evening to take care of my cats since I was gone all day and commented on how great the room looked! Now I’m encouraged to get rid of more and I’m sure I will! i love that phrase “crammed to the gunwales”!! I don’t get rumors b/c people generally know I hate clutter, but my mom can never seem to understand why I just keep getting rid of stuff. She’s a pack rat and I dread the day I have to deal with all her crap when she’s gone. charmed2482: I feel your pain. honestly. I also have a Mother like that. There is not one horizontal surface in their condo that does not have at least 5 things sitting on it. It will be mainly my job to dispose of her stuff eventually, and the vast majority of it I will not keep. She would probably croak right now if she heard me say this! ArtGal, your post made me smile. It is kinda weird that when you don’t want a lot of stuff people buy you even more stuff than they would if you wanted a lot of stuff. And be careful if you ride a bike to do grocery shopping. I’ve had strangers try to pay for my purchases before I can even get my money out. In this case yesterday the shoes were two sizes too small and too high heel so politely declined. Background: this friend is a shopoholic and I’ve dealt with this before. Last time she had a very expensive handbag to “give me”. I loved it but politely declined. Mainly because it just would not have suited my lifestyle and everyone at my would have wondered why I had such an extravagant bag. More recently I have found a wonderful life partner and we share my home. We rent out his house so we are doing ok (despite me spending a year at home looking after our baby). Meanwhile, my friend who can “afford” the most expensive handbags and shoes is still in her small apartment, and strangely enough I sometimes I feel like I should offer her something more than I have already, e.g. I’ve helped her move and declutter and advised against spending all her money without thinking…but what more can I do? Should I offer more advice, or should I suggest she buys her shoes two sizes bigger next time? My mom is a ruthless declutterer, they are full-time RVing and she felt like a failure when, instead of nothng in storage, they rented a little storage unit (I think 6×8?) for some furniture they decided to keep. But we had this problem with aunts, cousins, friends, and neighbors – especially with baby stuff, we didnt’ buy a lot of baby junk and people gave us SO MUCH. Also when I’ve refused to buy plastic junk for the kiddo (like glowstick bracelets at 4th of July) other moms sometimes give it to him because they assume we can’t afford it. We live in a pretty working-class neighborhood, though, so I don’t think it’s personal. One funny story: I dry my laundry on a line; I have one in the 3-season porch but when it’s really nice out i haul out a backyard one and do bedding and other big stuff that doesn’t get washed often. The neighbor kids asked me last summer if our dryer was broken. It occurred to me, reading through these again, that people often assume DH and I have a higher net worth than we do, just because we have so much space (i.e. the apartment isn’t full to the gunwales). The things we have bought are all carefully curated. We basically have no assets – yet. We have some friends who live in a badly-built condo, awfully cluttered, everything a hand-me-down, you would think looking at it that they are in complete financial disarray but their net worth is close to a million. Most of the people who know us well recognize that we’d rather have a few things that are exactly what we want. If you’re relatives have email start harrassing them with posts from your favorite uncluttering and minamilist sites! If you want to really drive the point home include a little note about the problem areas in their space. Like: since last time we were over you couldn’t the cookie cutters here’s an article on uncluttering your kitchen and pantry. Funny: my family and friends are afraid to buy me anything, because they know I will sell it or give/throw it away. So don’t even hide getting rid of any gifts. If you do this openly, they will think twice about buying you a useless gift. Ah, fortunately (in this respect) none of our families live close to us (I’m in Alaska, 95% of our relatives are on the east coast). And since my mother and mother-in-law have died, no one sends us “stuff” much. My sister-in-law sends weird calendars, but I can deal with that. @k00kykelly-my friends have basically stopped trying to buy me gifts and people know I don’t want stuff b/c i post on facebook about uncluttering and minimalism all the time. I talk about getting rid of stuff all the time. Sometimes I like to post things just to see what people will say. I posted that I was thinking of taking photos of all my high school art and then burning it. People don’t think I should, lol. I might be offering it to some friends and family and whatever doesn’t get taken that I don’t want I’m trashing, b/c I’m tired of it taking up space. someone said art was special, but its not special if no one wants it, including the person who created it. i believe that not all art is supposed to live forever. in my previous life as a chef and my current life as an artisanal soapmaker, i was/am involved all day long with making consumable art. none of it is supposed to hang around for ever….old food and old soap isn’t very appealing. other art forms may have a bit more of a shelf life…but when everyone is tired of them, it is time to let them go. free up the space for fresh art. We’re the ones with the clutter problem – the people who want to buy us stuff have half as many people in twice as much space, so they can have as much junk as they want and not have their living spaces cluttered up. My house has three closets, totalling about 21sf of floor space (3×2,3×1.5, and 3×3). My partner’s parents have a coat closet, a linen closet, four bedroom closets (each about 4x as big as ours), three bathroom closets… I wouldn’t want to live in their house, but they aren’t the ones who need uncluttering advice, you never see any of their stuff. I read this post a few days ago and am so glad I found it again, because my mother just let me know my grandmother was “concerned” about me. I had been talking with her about our upcoming (3rd) cross-country move and she was curious if we were going to hire movers. While I was telling her we were planning on doing a “pod” move (we pack a shipping crate and they transport it), I mentioned that it will not be too expensive because we simply don’t have that much furniture. She then asked me a couple of questions about items we had when we got married over 10 years ago- did we still have them? Apparently she was upset when I said we didn’t. Whoa! First of all, we got married a long time ago, when we were very young. (I was 19, he was 21). That cheap dining table that she asked about was downsized when we decided we’d rather not have a table since we didn’t eat at it, and it stayed covered with clutter. If we had kept it, it would probably have fallen apart by now, having been bought at Wal-mart. We don’t have a lot of things, but what we do have is of high quality, the very best we can afford. We have everything we need. A minimalist would laugh at our house, it has plenty of “stuff,” but we feel great about our low level of consumerism. I’m very proud of our home and felt extremely offended that she would be “worried” about me because I choose to let go of some of the items we set up house with over a decade ago!!! I thought about giving some of my books on uncluttering and voluntary simplicity to my mother but I don’t think she would read them. Either that or she will just get mad b/c EVERYONE is always telling her she has to much stuff. I think she is or used to be a borderline hoarder. not one of the really gross ones that keep trash, but she has so much stuff its really hard to keep her house clean and bug free so it gets pretty gross sometimes. Also her boyfriend is always on her about keeping stuff and she’s simply tired of hearing it and feels like people are treating her like a child telling her what she should or shouldn’t get rid of. I have gotten to the point where I really don’t care and don’t comment, but I try really hard not to add to it at all, so I don’t like giving her stuff at all anymore, not even Christmas or birthday gifts b/c she just has enough. even my little brothers and her boyfriends kids didn’t want me giving them a book set b/c she has to many books, and the books weren’t even for her it was for the kids. so think if I gave them to her they would just be lost in all her other stuff. She is better now, she does get rid of some things and doesn’t keep everything, but she has a lot of collections and has a hard time letting things go even if she hasn’t used, touched or looked at it in many many years. If we’re very lucky, we’ll be able to find a place a third the size of our current home, and all of my furniture is second-hand as it is — why should I pay to ship it several thousand miles only to find I can’t get it around the bannisters? (Happened to one of those girlfriends with an American-style fridge.) It can go back to the consignment/thrift stores where I found it, and I can have fun with a new style. We keep just the crockery we need in our kitchen cupboards. We store the rest that we use for parties etc in our side board. The other day my mother-in-law showed up with a set of coffee mugs as she thought we didn’t have enough. pkilmain…your niece’s website, and her soap, looks lovely! hmmm, giving away the uncluttering books. now that is some food for thought. i don’t think i am quite ready to do that.